In 2015 one of our long term customers - The german "Green Dot" - relaunched its logo and appearance to a new fresh incarnation of one of the first and most driving international recycling brands. The "Green Dot" has changed the face of professional recycling for over 20 years in Germany and then all over the world. Instead of just updating the logo on the existing roadshow equipment, acsr idustrialdesign worked close with the public relation department to boost the impact and add experience using the latest Oculus Rift and VR technology. 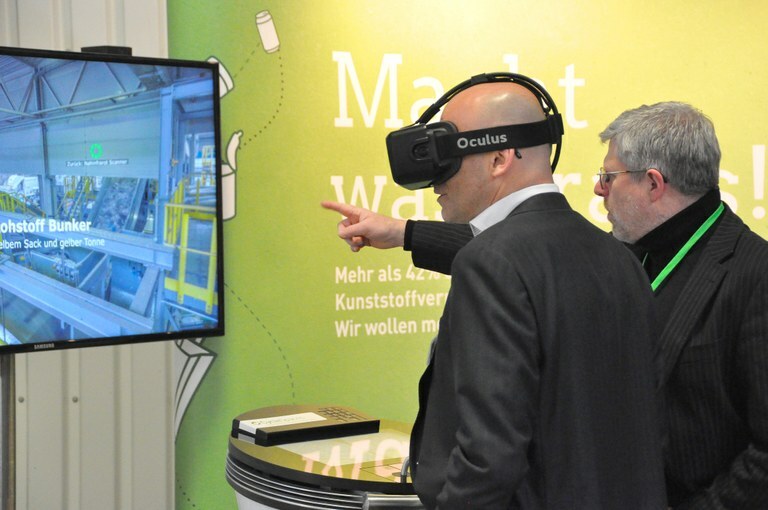 "Exploring the CycleSpaces VR Experience, you can immerse into an actual sorting plant." acsr and evenios had the chance of providing an impressive tool to inspire a higher confidence into the messaging of the communication department. Everybody can now verify the existence of the technology to seperate important resources out of our everyday household waste collection. 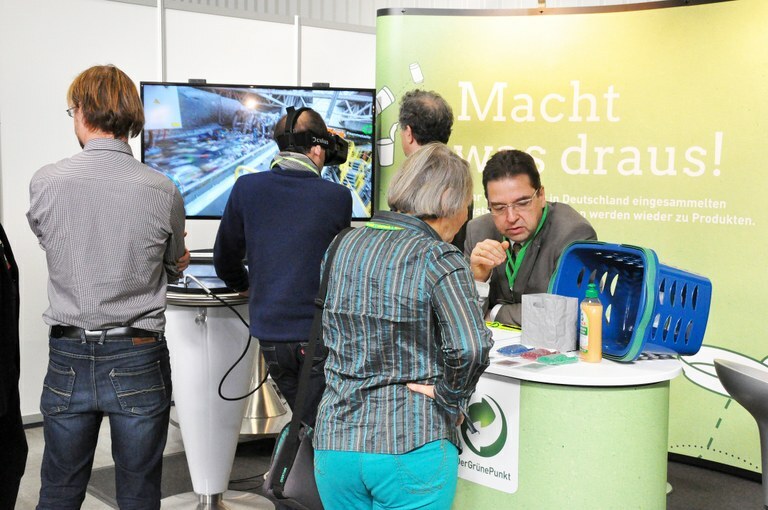 Exploring the CycleSpaces VR Experience, you can immerse into a state-of-the-art sorting plant that processes the mixed input into dedicated plastics, aluminium, iron and reusable compounds. They now can manage over 100 people per day to take an insight into the crucial technologies by just wearing an Oculus Rift based VR headset. During their virtual visit they can watch mechanical or magnetic dividers, endless transportation belts and high tech near infrared scanners that help seperating all kinds of plastic parts. Different base materials like PET or Polyethylene are moved into different bins using pressure air impulses. 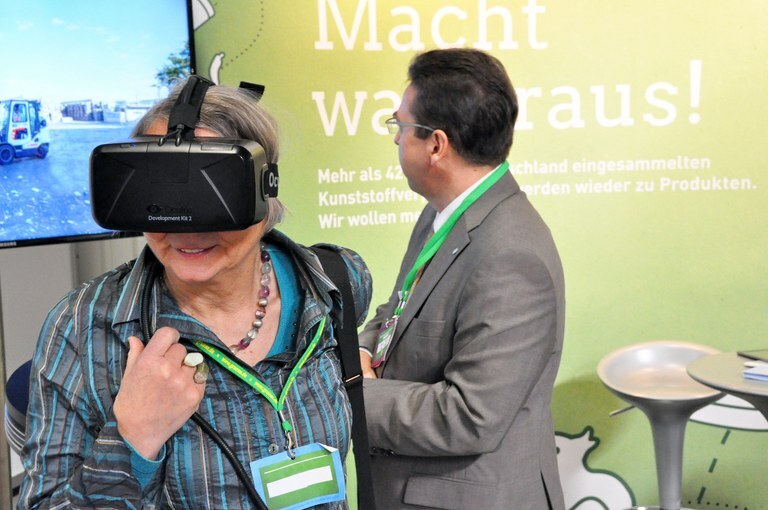 Immersive communication makes it easier to give wider audiences a deeper understanding of the possibilities of the technologies already in use. Instead of animating artificial 3D worlds CycleSpaces uses panoramic images taken in the real plant to create a feeling like actually being there. One nice sideeffect of VR is that you can avoid the malodour that accompanies that kind of processing. The "Green Dot" receives great feedback from common visitors and responsible representatives due to this experience. Even a lot of their own employees have now the chance to both get an insight into the technology during internal events as well as to show it to involved business partners at all kind of venues. We used already mature stationary satellites with build in High Performance gaming PC hardware to drive the Oculus. With their green light effects, the solid standing cones are an unbeatable eyecatcher on the booth that attract visitors already from a distance. Before you loose ground in the virtual world, the handles provide orientation and help to feel safe. The usual queue of waiting spectators and the promoter team can follow the journey of the visitor through the location either by the build in control monitors of the satellites or a big high-res screen that gives a fine detailed and crisp image of what is going on inside the VR world. Promoters love the engagement of the visitors having a fresh impression of the impact of the technology when discussing details afterwards. This experience will last some time. And even when the technology is becoming more popular and common, taking the opportunity to visit places usually unreachable will stay a key benefit of the VR and AR systems that are available now and will be coming in the near future. VR without useful content is nothing. The CycleSpaces experience of the "Green Dot" is one of the more serious applications of this next generation edutainment. acsr has been involved for over 20 years in the concepts and designs of various roadshow and exhibition projects of the "Duales System" the holding behind the brand. The equipment produced, based on smart and robust designs, is renown for its everyday reliability to spread ideas and technologies to public audiences. Recycling of waste into resources is more popular and necessary than ever.